Sometimes people think bland and boring when they think of “diet” foods, but that doesn’t have to be the case. I always encourage you to play around with textures, colors, and flavors to keep things fun. One of the easiest and calorie free ways to do this is with spices. They come in all flavors, heats, intensities so there’s got to be a few that you’ll end up really loving. Who couldn’t use a little spice in their life, right? 😉 Indian food (along with a bunch of others) takes the spice to a whole different level. They get crazy and throw in colored and fragrant spices in most of their cooking. Curries, masalas, and coconutty things. 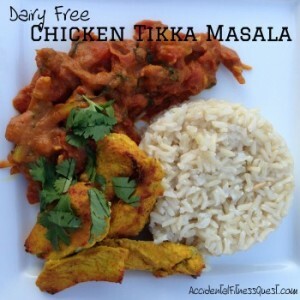 I love the thick spicy sauce that comes with chicken tikka masala. Typically though the chicken is marinated in yogurt and the sauce contains cream. Mix the first batch of the spice mixture in a ziploc baggie, and add 1/4 cup of almond milk and chicken strips. Zip tight, and shake and smoosh to mix. Sit the chicken aside for about 30 – 45 minutes while you start the rice. Cook the rice according to package directions. I used my Instant Pot so it was pretty hands off. Heat a skillet over medium heat and add the olive oil. Swirl the pan to coat and add the sliced onions, tomato paste, cardamom, and crushed red pepper. Cook for about 5 minutes until the onions have softened and the tomato paste starts to darken. Add the second batch of the spice mixture, and cook for about 2 minutes to toast the spices and bring out their flavor. They will start to brown and slightly stick to the bottom of the pan in places. Don’t worry but watch to make sure they don’t burn. Add the tomatoes and juices and bring to a boil. Simmer the mixture for about 10 minutes, stirring every now and then. You want to scrape off any browned bits stuck to the bottom for flavor. After about 10 minutes, add the 3/4 cup of almond milk and cilantro and stir to combine. Cook for about 20 minutes until the sauce starts to really thicken. While the sauce is simmering, preheat your grill or the broiler on your oven. Remove the chicken from the spice marinade and discard the baggie. Grill or broil the chicken strips over direct heat until they start to crisp and brown on the edges. You really want that crispy charred edge to them. Once the chicken strips are done, remove from heat and let them sit while the sauce finishes up. When the sauce and rice are ready, divide the rice evenly onto plates or in bowls. Top with the chicken and sauce, and garnish with a little cilantro if you like. Makes 4 servings at approximately 353 calories – 28g protein, 43g carbs, and 9g fat. You actually need to make two batches of the spice mixture above. One to use in the marinade for the chicken and one to use in the sauce. Yes, you can double the measurements and then divide the mixture in half, but I found it much easier to just make it twice. That way I didn’t have to wonder if too much was in the chicken and too little in the sauce, etc. Yes, I’m weird that way. I make my own garam masala instead of buying it in the store pre-made. I don’t use it too often so it’s just easier to mix a small batch from spices I do use a lot. I’ve used it in Shrimp Vindaloo as well as Green Lentil Dal. You can easily lower the carbs if needed by using half the rice or leaving it out completely. I had the leftovers mixed with chick peas. You can use naan, pita breads, chips and more so play around with it and have fun.